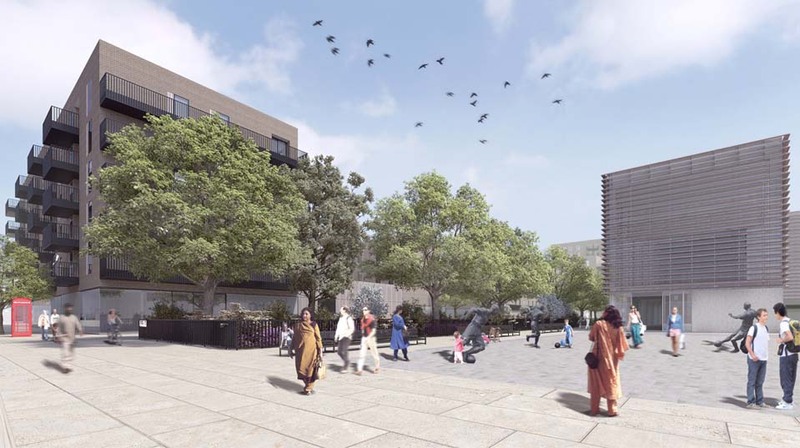 UNIT’s design for this East London Master Plan is centred around two new major public spaces, connecting previously disparate parts of a unique community and reinvigorating a historic street market. The proposals comprise 208 one, two and three bedroom apartments across five apartment buildings; 24 townhouses and 16 houseplexes; 100,000 sq.ft food retail store; 3500 sq.ft retail unit and a new community use building. The diverse buildings are unified by a common architectural language and a robust but timeless palette of materials that will weather gracefully over time. The architecture draws on historic London precedents of terraced townhouses and warehouse. Proportion, rustication, brickwork and ironmongery are used as tools to evoke an understated elegance of period architecture whilst clean contemporary detailing and materiality set the buildings in their modern day context. Historic Gardens are reinstated as an arboretum and green space connecting the street market and existing public park, in the tradition of London squares.